Ensure that costs are consistent with the budget and incurred during the period of performance. Discover any errors in your budget, encumbrances, or expenditures. Ensure compliance with the sponsor's spending terms and conditions. Verify that cost transfers and corrections are made in a timely manner. If you identify a problem, do not wait until the project has terminated before addressing the issue. The longer an error remains uncorrected, the harder it is to fix and support corrective action in an audit. Expanded authorities are the operating authorities provided to grantees under certain research grant mechanisms that waive sponsor prior approval normally required for specific actions. For example, a researcher may wish to extend the time allotted for performing the work without requesting any additional funds (called a "no-cost extension"). In some cases, prior approval of the funding agency is required for this action; in some cases it can be done without this explicit approval by "expanded authority." Please consult with OGCA for details. 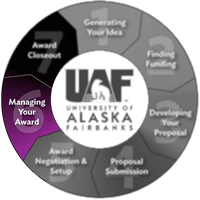 An incoming subaward is a formal written agreement made between UAF and another organization (the prime recipient), where UAF will perform an intellectually significant portion of the scope of work (SOW) under the other organization's sponsored project. Money is awarded to the prime recipient by the sponsor and then passed to UAF. An outgoing subaward is a formal written agreement made between UAF (the prime recipient) and another organization to perform an intellectually significant portion of the SOW under a UAF sponsored project. Money is awarded to UAF as the prime recipient by the sponsor and then passed to the subrecipient. If you have an outgoing subaward, please reference the subaward templates and policies on Procurement and Contract Services' forms page.